Each of this dreams/essays are so poignant because they exaggerate what we already do as people everyday, the time makes actions absolute. The Nows and the Laters, everyone lives on a spectrum somewhere between them, oscillating in reaction to circumstance. But is this how life would really be if you could live forever? You wonder how long you would last if you could live forever. I suspect not very long. One time can bleed into the other. If you lived forever than would time be relative. To what would you compare it to? My forever to your forever? My time as a now vs my time as a later? But if everyone lived forever how would we ever know our past and who we are. The past, present and future would all be one. Maybe we’d all be catatonic watching centuries go by before taking a sip of water to remember the taste of nothing. We could all be the same together or the same alone. 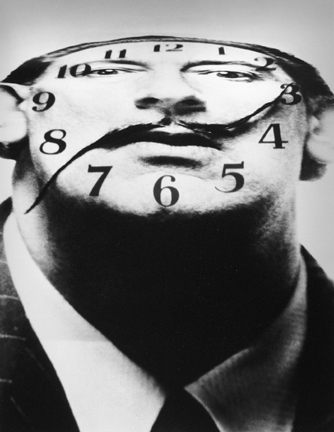 Is there a sense of self without time? Without a past or a future? And if time is shorter is your sense of self stronger? In all of this it is perspective that pervades. Everything is the end or beginning or somewhere on the line. In a world with no sense of future each moment is the end of the world and that is paralyzingly fearful or the ultimate freedom to dissolve into the senses. Does time even matter in the end? Are you trapped or are you free? Nothing means nothing, or nothing can mean everything. I’ve always admired the obsessed: whether it’s an artist, a scientist, or a historian. These people that encircle the “periphery of the body of knowledge” as Irwin calls it. To me there’s something very noble in the complete dedication in pursuit of an answer and it is people like this, and the questions that they ask, that propel our world further. It was interesting to read the chapters The Dots and The Discs as case-studies of Irwin’s different obsessions and see how his different questions and answers informed one another. Looking back on his work, like in the Whitney Retrospective, you can see a line that ties everything together. How without knowing it, in the end he was going deeper and deeper into something. In the beginning of The Dots, Irwin stresses that Weschler be careful in how he ties together the narrative of Irwin’s work so as not to give the impression that he had a clear trajectory. Irwin wants other young artist’s to be aware that his path was formed by intuition and at the time he had no clear idea of where he was going. He was led by questions and some, like the post-disc experiments, weren’t resolved. It is this pursuit in darkness, that in my opinion, really defines a great researcher. It is very risky, and failure is probable, but it is where real progress is made. I have a new found respect and admiration for Robert Irwin after reading Seeing is Forgetting the Name of the Thing One Sees and as someone that I think is just starting to find their own questions it was inspirational and affirming. Every discussion boils down to the definitions that it employs There must be a common consensus on what is “real”, what is “fake”, what is “art”, what is “technology”. But who gets to decide what is defined? How can you? This past week the subject matter of two of my classes Recurring Concepts in Art and Nothing have overlapped. I’ve been reading a lot about the Dada movement, readymades, and what are considered radical innovations in the art world and see this wonderful dance at play between artists and the institutional art world (also the general public). 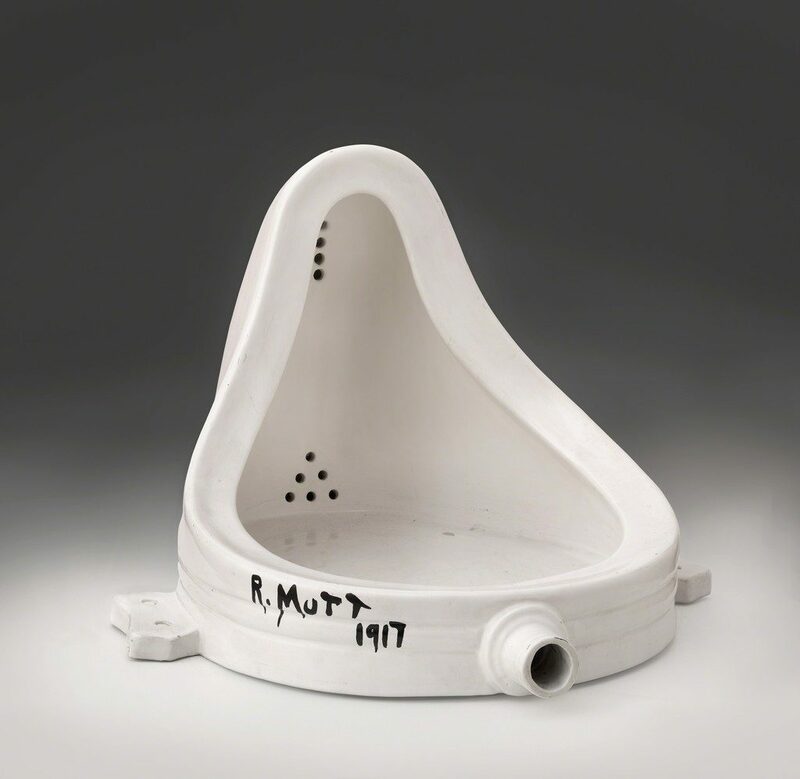 When Duchamp submitted the Fountain to the Society of Independent Artists’ salon in NY, which claimed they would accept art that was paid for, it was rejected. It was considered a joke. The Fountain now resides in the SFMoMa. Somewhere along the way what was a statement, that was received as a joke, turned into an approved seminal piece of art. It was not the academy that decided what art is but the artist. However the academy, the art world, still remains as the authority. And yet you still have your audience that sees an upside urinal with scribbles on it, says I could do that, and dismisses it’s relevance and existence as a piece of art. F for Fake approaches these concepts of real and fake and art and authority in a very playful and successful way. You observe these concepts through the looking glass of the concepts themselves. The way how it shows how art can feed off and aggrandize itself is quite marvelous. I love the quote the quote that fake and frauds are old but what’s new are the experts, the authority. That it is these experts that are ‘god’s gift to the fakers’. And where everything gets interesting is where the money comes in “value depends on opinion, opinion, depends on the experts, a fakery makes fools of the experts so in the end who is the expert or the faker’. This brought back to something we discussed in Recurring Concepts in Art. 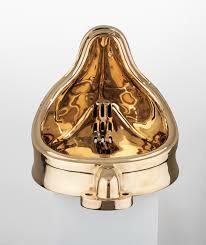 There was the Fountain (After Duchamp) by Sherrie Levine. This was purposeful imitation art, imitation art from the beginning. Sherrie Levine made another Fountain but with conscious changes, and you can read what you want into those changes: it being made by woman, in bronze, each its own comment on the original and it’s reception and the current state of the art world. But the next piece we talked about by Sherrie Levine I found so surprising. It was a photo of a famous photo. I couldn’t believe that this had been accepted by the art world as art. Yet Sherrie Levine was already famous as an imitation artist when this was made and so the it was less controversially accepted as art. Elmyr de Hory’s work initially passed it off as real and only once caught, made an art of imitation itself. Elmyr de Hory states that he only sold fakes first because no one would buy his original art. So were Sherrie Levine’s original pieces different and successful enough to than warrant later a full acceptance of an imitation? 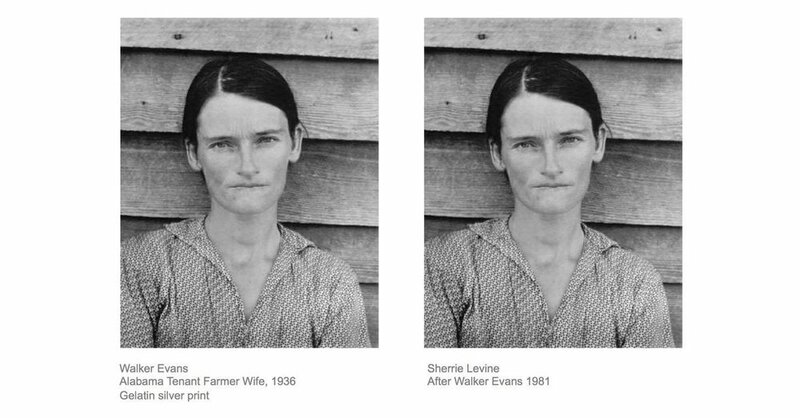 Sherrie Levine made a whole series of Walker Evans photos which was then acquired by the Evans estate to prevent their sale and then she officially donated them. They are now all owned by the MET. So her work defined as imitation from the beginning but pure imitation, didn’t make money, but was easily accepted by the art world as real art because of the way the idea was presented. I wonder what would happen if one of those pieces sold now? Would it be able to? 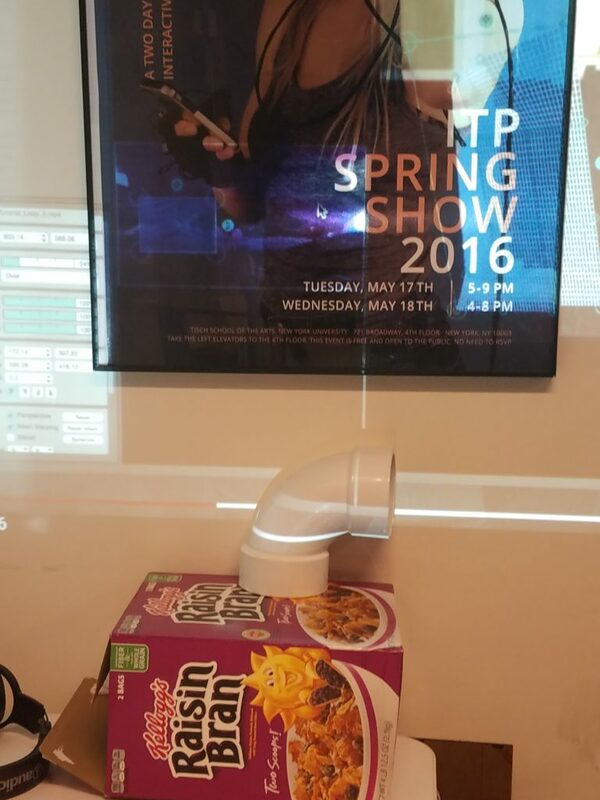 It’s been accepted as it’s own thing now, art in it’s own right and now a piece of history. But again how can you define the value of this? Who could? And what would it be in relation to the Walter Evan’s originals. Emyr de Hory’s work on the other hand was sold for money, sold for way more money, and approved by galleries and museums as authentic before becoming ‘ a profound embarrassment for them all. His mastery of painting and his skill allowed his paintings to be, for a time, indistinguishable from these ‘genius masters’, but no there was no value in the skill itself. He then tried to make it as an imitation artist once his story had been revealed but it seems he was ahead of his time. Perhaps he was too late in making imitation part of his statement. If he had revealed the forgeries himself before being discovered as some grand coup d’etat of the art world and experts and authenticity maybe he could have sold it as performance piece himself. He committed suicide upon hearing he was being extradited to France on charges of Fraud. F for Fake truly shows how fragile and illusory these definitions are. How we create value, build it up, burn it down. It shows how much of art or really life can be about the sell, the story, the reception, instead of the actual product itself. Emyr de Hory seemed to excuse himself by saying he was making beautiful pieces that they enjoyed, and this story reveals how much enjoyment really came only from the perceived value. For the final I worked with Alex Zimmer and we made a prototype for a fellowship we’re trying to get. As much as I am fascinated by AR and learned so much in this class I still think we are so limited by our phones. The only thing that will make me look at the world through my phone is a story or to learn something. For the fellowship we have to make an AR app related to the year of 1968. We decided to focus on protests that occurred that year as a way to maintain a focus but still tackle the wide variety of issues that were going on. We’d also like to find a way to tie it to protests occurring today which are mainly about the exact same issues. While there was ample images and videos available, the videos are not of the highest quality and we knew we would want to recreate some. So we explored shooting people on a green screen to then see in the app. We did a super quick and dirty prototype. There are obviously more things we want to do with this such as add audio that guides you + GPS to get more accurate locations, figure out how to fade out and keep the video turnt toward you no matter where you are. I also want to play with the idea of how we can get people to leave their stories there. For example if there is a protest going on how someone using the app could document it and leave it for the next person that uses the app to find. How many things do we own that were built with child labor? How many with slavery? What is the carbon footprint of the objects that we own? People are trying to be more conscious with their purchases, but it’s hard. It’s hard because people are lazy. Are you going to Google a company every time before you purchase a product from it? A $20 sweater from Zara sounds great until I know that the fabric came from factories in Asia known for dumping highly toxic waste into waterways in Asia and with workers paid far below living wages. We want to create an app that makes it easy for you to make informed and responsible choices. To be able to scan an object, tag or advertisement, and see a rating of this product or corporation based on environmental or social performance. Simple and easy and it can keep track of your purchases and let you know if you’re making progress. This piece was inspired by an assignment in another class. In Cabinets of Wonder we were tasked with going to AMNH to go and see the dioramas and then make a diorama of our own. I went for school but rushed through because I had already seen them twice before. It was a pity. We’d spoken in class about how outdated the dioramas (some are borderline racist) but it’s extremely expensive to change them or update them and they’re part of the permanent collection. I thought it could be interesting to toy with the idea of AR tours of permanent collections. You could make numerous tours that approach the collection from a different angle. It would allow you to see the same thing over and over again but learn something new each time. For this prototype I chose animals in mythology. 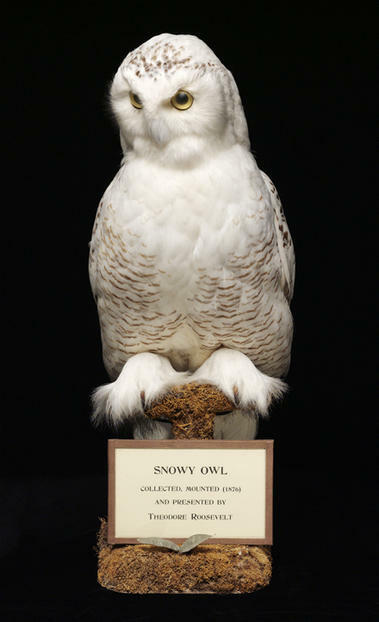 Below is an owl which in Greek mythology represented the Goddess of Wisdom, Athena. For the purpose of this project I wanted to try out object scanning and recognition with Vuforia. I had a lot of difficulty getting it to work, I rescanned objects tried it in different lighting but no matter what I did I couldn’t get it to recognize it in Unity. After about 6 hours of redoing everything I realized that unlike Image Targets the max amount number you can have simultaneously is 2. I had mine set at 3 and even though I was only looking at one object at a time the 3 there rendered everything obsolete. After I figured that out I tackled adding sound. It was something I’d tried to get before to work with the image markers but did not succeed. However this time I did, I need to copy some code from Vuforia and use their library. I love the warmth that plants add to your apartment but I am a plant serial killer. I’ve tried calendar invites, alarms, reminders I always forget to water them or move them. I find all the info online about the specific needs of each plant but it is in one ear and out the other. I want to make a projection on the pot of the plant that tells you when you need to water the plant. Depending on the type of plant the complexity of the projection could change. Some plants just need to be watered X times a week that would be simple to set up with a projector. 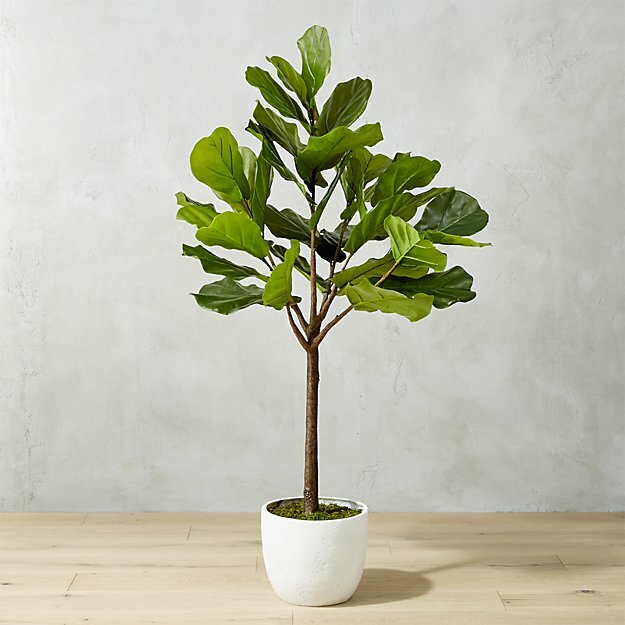 But if you wanted to get really fancy and step your plant game up to the beautiful difficult ones you could add sensors into your plant that would monitor it’s health. If it needs more water, if it needs more sun, soil quality etc. The sensors could transmit to the projector which could voice the plants needs. I like the idea of the plant talking to you. It’s almost more like a pet and you are more responsive to it’s needs. AR allows you to show people the hidden, the unseen. I can show you what I see. I can put my filter of the world on yours. I’ve always found Roschach Tests so fascinating, not that I believe in their scientific validity but there’s something so earnest about people’s answers. You know that what you see is supposed to represent you, your mental state and supposedly clue a psychiatrist into your subconscious. I think there’s something romantic and vulnerable about allowing other’s to see what you see in inkblots. The inkblots are also a perfect image tracker, they are so distinct. I’ve managed to get Vuforia to work with videos and 3D assets on the computer and am now attempting to get it to work on my Android phone. I thought transferring it onto the phone wouldn’t be so difficult as I heard android is easier than ios. So not the case. After downloading the jdk and sdk multiple times, multiple versions, from multiple sources and obsessively checking the sdk pathway I found that there was an issue in the sdk download itself that Unity tells you to download. The tools section doesn’t work, I had to dive deep into a forum to discover. Probably like 4 hours spent figuring this out.